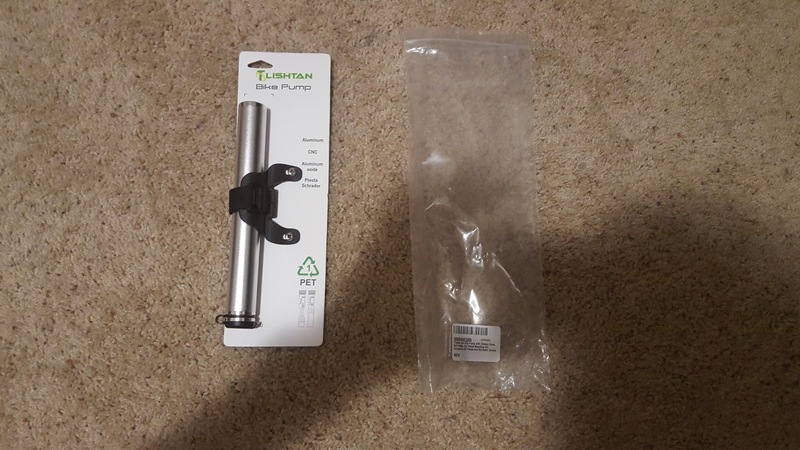 So I was lucky enough to receive a free bike pump from Tlishtan. The pump feels durable and is 8 inches when in its compact mode. Another nice feature is a life time warranty; however, after searching for a website, Tlishtan doesn’t have one. So I wouldn’t put much faith in that. Thankfully, instructions aren’t really required for a pump and the instructions printed on the package are more than enough to get you going. So sit back and continue to read the review. 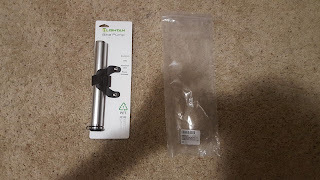 When I received my Tlishtan Bike Pump, I was a little surprised by what was in the package. I don’t think I’ve ever seen a pump with a design like this. 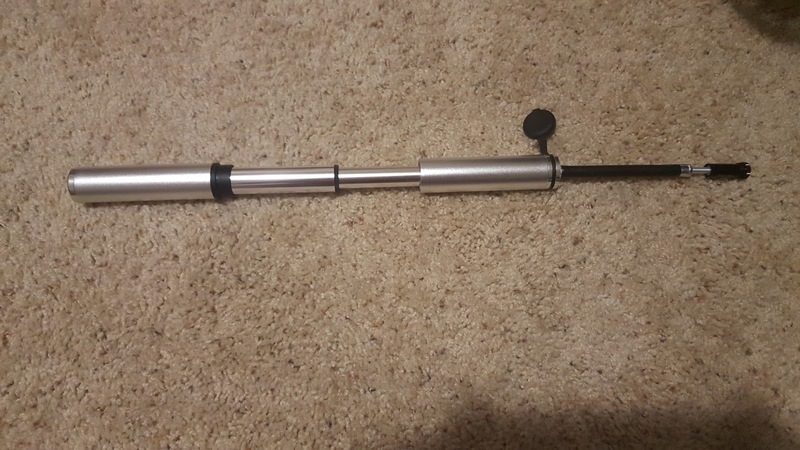 The pump has an internal screw on connector that slides out instead of the normal fixed end. 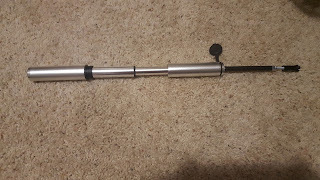 Tlishtan made its pump out of aluminum and the ability to connect to Presta and Schrader valves. Furthermore, this pump weighs is on the heavy side at 5.4 oz (according to my kitchen scale) and can air up tires all the to 100 psi. The first thing I noticed picking up the Tlishtan pump was the weight and the feeling of durability. I have no doubt this pump will outlast the plastic holder. Another huge plus for me is the ability to pump air quickly. Most hand pumps I’ve used snag when you start getting to higher psi. While there was a little snag, overall the pumping experience was much smoother than anything I’ve previously used. Furthermore, the valve connector attaches fine to Schrader and Presta Valves. I have each type of valve on my mountain bike and had no issues connecting or staying connected. Finally, I think the design is great. The pump is created in a way that lets the user move the pump in different ways to maximize comfort without damaging the valves (this is done by a flexible hose). Plus, the design offers internal dust protection. One of the smallest issues is the weight. I probably won’t be taking this pump with me on my road bike because of how heavy it is, but it’s a fair trade off for the durability. Second, I think the psi range is a little lacking. 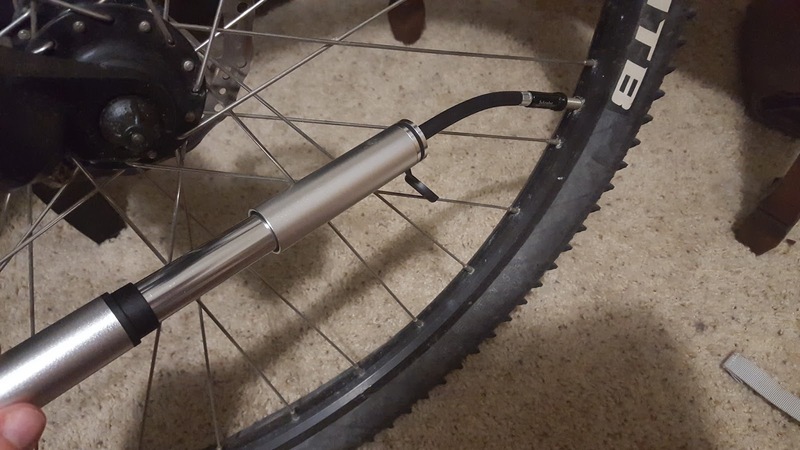 I use my road bike with a higher pressure, 110-120 psi, which is out of this pump’s safety range. Finally, my biggest issue is with the plastic/rubber dustcap that covers the valve connector. With the slightest of touch or easiest of ride, the dustcap pops off. This pump was designed so well to prevent dust getting into the internals and to pump smoothly just to throw it away with an ill-fitting dustcap. What type of pump are you using, floor, mini, or CO2? I'd love to know your thoughts. If you like the blog, go ahead and follow us on Facebook.